At Urban Paving we love to introduce sleek, urban materials such as our concrete pavers side by side with the beautiful textures of nature. Rich colours and interesting texture make pungas a favourite to achieve this effect. Pungas are a timeless and cost-effective product to border your garden or driveway, available in 2m lengths. 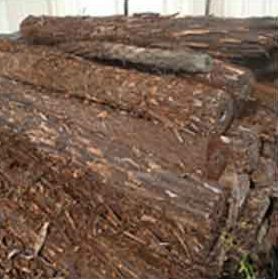 Used for landscaping, punga logs are ideal for edges and steps of garden pathways. Fill your punga paths with bark to achieve the feel of a natural NZ forest garden, or use pebbles for a texturally interesting look.